Many brides who decide to get married away have the same concerns particularly when you don’t have time for make up trials when you land! Whether you decide to do your own make up to save money or you just don’t have time or trust in researching make up artists over there – perfecting the look you want quickly and easily on your wedding morning is achievable when you plan ahead. The first thing you will need to do is decide on the look you are wishing to achieve. Keeping it natural will make the application easier on you and is the ultimate blushing bride look especially in warm Countries. Also you need to take the heat into consideration-You will probably want to keep the layers at a minimum! 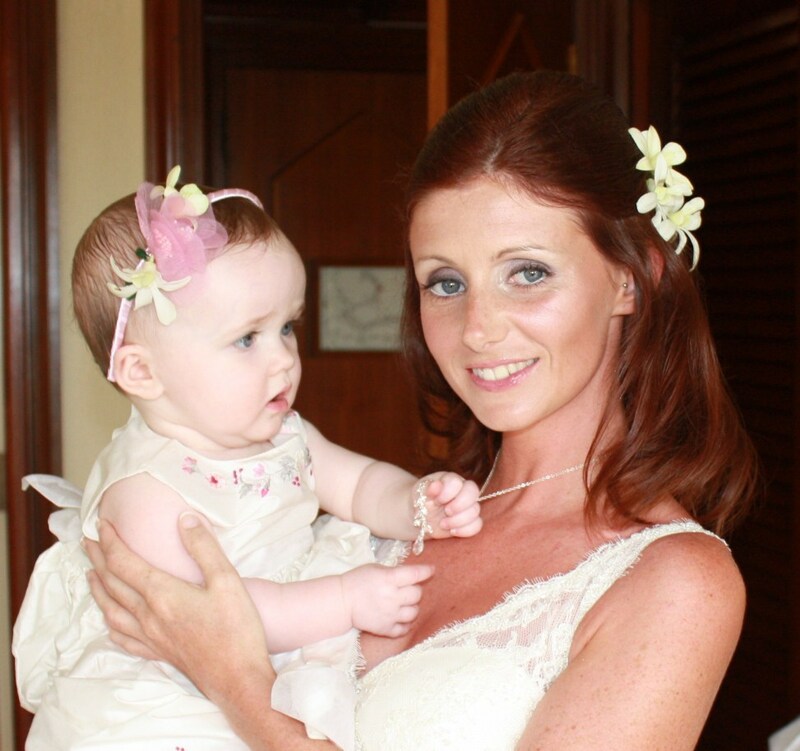 You may find inspiration in wedding magazines and from your favourite make up artists websites. Once you have found a look you like, take a photo with you to a MUA for a make up lesson, they will show you and advise you which colours and products they think have been used on the model and how you can replicate the look at home. 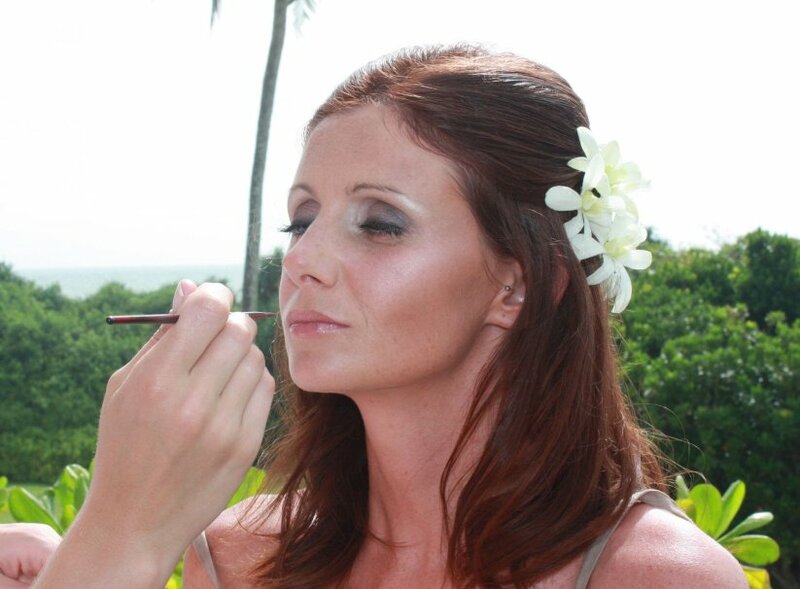 Soft kohl eyeliner, white is a great choice for bridal pictures! Brown or black mascara. If you are expecting to shed a tear or two on your wedding day, you may opt for a waterproof mascara. Lip gloss with a matching lipliner. Although matt lipsticks can be longer wearing but can dry out your lips. Glosses give a much more flattering finish and can be re-applied much easier throughout the day. Applying a lipliner underneath the gloss will not only enhance the shape of your lips but help the gloss last longer! Book a make up lesson with your MUA a couple of weeks before you leave for your destination. You can perfect the desired look you want on your wedding day all by yourself ! Although you may not have wanted the extra expense of paying for a lesson it will be far cheaper than paying to get your makeup professionally done on the day for your entire bridal party. Your makeup artist will know which makeup products are best for your skin type and which will be the most photogenic for you! They can also offer advice on a skincare regime that you can do leading up to the big day to make sure your skin looks healthy and clear. After you have had your make up lesson and purchased the items you need, make sure you practice the look a few times so that you will know exactly what to do on your wedding morning. The more you practice, the quicker you’ll get at perfecting the look. If you are having difficulty applying any of the products you can always go back to your make up artist for a recap. It is important to look after your skin leading up to your wedding day so your make up will look flawless! Foundation does not sit too well on oily or flaky skin. While if you are prone to acne and shine you will want to do everything you can to avoid a breakout on the day. If your not sure on how to look after your skin ask a skincare specialists in your local pharmacy, they will guide you what to use on your skin type. If you are not used to exfoliating or using masks make sure you start doing it in good time before your wedding so that your skin gets used to it and doesn’t have any bad side effects! Avoid starting any new skincare products too close to the wedding incase of skin reactions. Allow enough time to do your makeup on the morning. Your lipgloss or lipstick is the product which will need re-applying throughout the day so remember to take it with you. If you have oily skin, you may want to take some blotting pads and powder with you to absorb shine later in the day. If you would like more advice, feel free to contact Sharon for a one-to-one session, or sign up to one of my upcoming mastersclasses.